In Greenpoint, real estate is evenly split between Polish-Catholics and the cast of Lena Dunham’s Girls. You’ll walk past mom-and-pop butcher shops and Eastern European bakeries right beside minimalist cocktail bars boasting negroni fountains. The neighborhood weaves Park Slope tropes (quiet tree-lined streets; frenetic public school playgrounds) with Williamsburg vibes (too-trendy 20-somethings toting vintage bikes) into its own unique tapestry. Amid the school buildings and farmhouse-inspired cafes, the heart of the area’s Polish history still beats loudly -- old-timers and newcomers alike prize the beautiful churches, authentic meat markets, and friendly neighborhood grocers. Greenpoint may be closer to Queens than downtown Manhattan, and it may be off the G train and only the G train, but its relative inaccessibility preserves its cloistered culture. This is where to head when you hanker for the most authentic pierogi-kielbasa meal you’ve had to date, or nouveau-American fare from an excellent, undiscovered corner spot that couldn’t afford Williamsburg rent. We promise you the food is worth the trek. 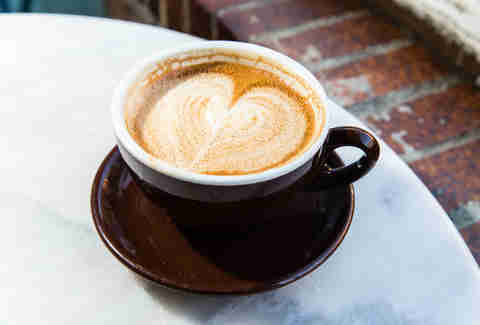 Founded in Bushwick, Variety is one of few remaining Brooklyn coffee shops that still abstains from charging a small dowry for a cold brew -- theirs is $3.50. The thimble-sized Greenpoint location barely has room to contain the line that forms at the coffee counter each morning. A rotating series of paintings-for-sale by local artists adorn the walls, the baristas will no doubt remember your face, and the coffee, roasted locally, is among the finest in Greenpoint. 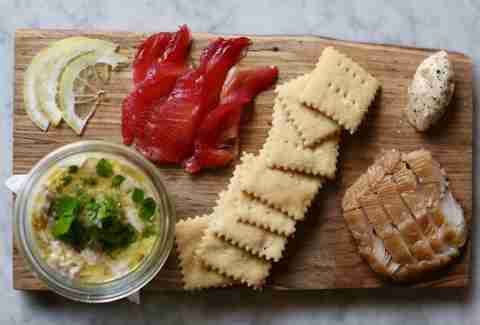 Part fish market and part seafood kitchen, this crisp, white, Nassau Avenue spot is Brooklyn’s answer to Russ & Daughters. Servers wear white lab coats, high tables are inset with white marble, and sundry seasonings are arranged on shelves across from the fishmonger display. 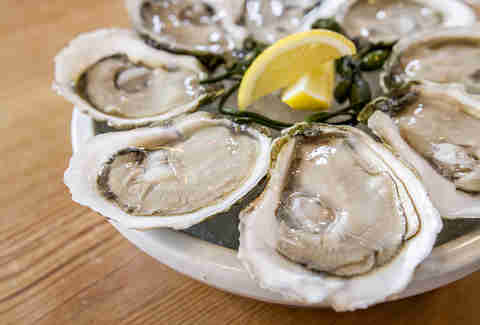 Come for happy hour and crack open fresh oysters from the raw bar (there are seven varieties, starting at $1.50), or grab a beer and stay for some fish collar and a whole steamed Maine lobster. From the outside, Cherry Point blends into the street like an unassuming diner. The menu is small and classic; the place is rarely crowded. The kitchen ain’t exactly innovative, but the basics are extraordinary. The cheese and charcuterie plates featuring rib-eye cap, smoked whitefish, and Fromager d’Affinois come carefully arranged on a weathered board with She Wolf Bakery sourdough and house-made walnut bread. 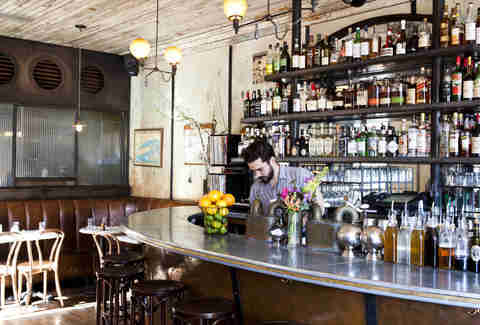 The cocktails are nuanced twists on classics (an Old Fashioned with root beer bitters), the space is intimate and warm, and the oysters alone will make your visit worthwhile. From the owners of Van Leeuwen ice cream, this tirelessly hip modern Balinese spot is certainly doing something different. In a foodscape overwhelmed with contemporary American fare and sturdy Polish staples, tropical Indonesian fare is not exactly easy to find. The restaurant is bright and festive with neon signs and palm trees throughout, and the majority of the soju cocktails are served with colorful paper umbrellas teetering inside. 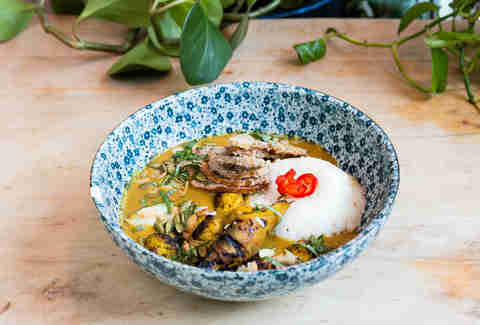 The dishes, while out of the ordinary, are comforting nonetheless, filled with coconut milk, Thai basil, and lemongrass. And while plates like grilled fish in banana leaf with Thai bird chili and tamarind are showstoppers, the egg-heavy brunch menu is equally delicious. For the final Van Leeuwen touch, be sure to order the black sticky rice-ice cream concoction. You won’t be disappointed. Tucked far enough into Greenpoint to keep the masses at bay, Milk and Roses is the ideal spot to bring a romantic conquest. The place serves an all-day spread of modern Italian fare in a space that looks like your nostalgic grandmother’s living room. There are two roaring fireplaces, plush armchairs, innumerable bookshelves, and massive front-facing windows. In warmer months, the outdoor space is lined with tea lights and overgrown greenery. 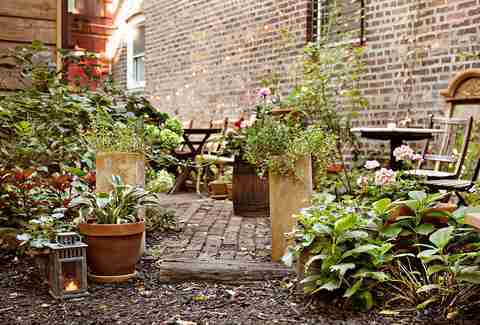 It’s about as close to The Secret Garden as you’ll ever get, with far better food. Little-known fact: this buzzy Greenpoint locale was a passion project of the late, great Heath Ledger, though he never lived to see it through. The space is narrow and dim, with a cast of waiters and clientele who all appear to have worked very hard in order to look like they just rolled out of bed. The bar is shaped like the prow of a ship, exposed brick lines the walls, and the drink menu offers upwards of 20 craft cocktails. On weekends, the line for brunch typically extends outside and around the corner, but if you’re looking to skip the wait, show up for happy hour instead. Grab some $2 freshly shucked oysters, an enormous cheese board, and a creative house cocktail like the Cardamomagedden, made with with scotch, cardamom syrup, and dry cider. Enid’s is the sort of place where you might find yourself dancing until 4am, only to return at noon the next morning for a hangover-soothing Bloody Mary. The local dive serves modern Southern food by day (get the huevos rancheros topped with avocado and queso fresco), a full roster of breakfast cocktails, and some truly unrivaled buttermilk biscuits. At sundown, a DJ takes up residence on a riser above the bar, and the tables are stacked in the corners to make room for the dance floor. From the outside, Pyza appears to have seen better days. Or perhaps it’s always looked like a dated bodega with a sun-bleached red awning. Regardless, the long-standing kitchen is among the most authentic, gimmick-free Polish spots left in the area. In a nod to the neighborhood’s history (and its still-thriving Polish population), the mainstay is known for truly classic homestyle kielbasa, cheese blintzes, perfect pillowy pierogi, and thick steamy borsch. And best of all, you’ll pay less than round-trip MetroCard fare for a plate of kielbasa and sauerkraut, complete with a side of potatoes and pickled vegetables. Among the cascade of new restaurants on Franklin Street, Anella is easy to miss. 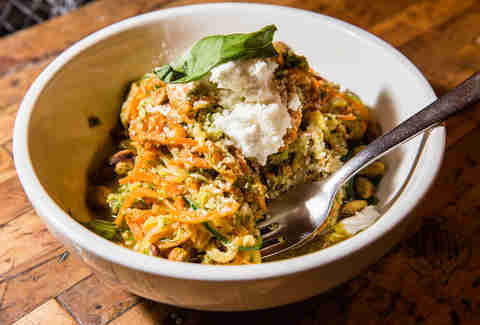 The little place could have been plucked from a Parisian back alley, with rows of intimate two-tops, a bustling open kitchen and the sort of updated farmhouse decor that has become standard in Brooklyn restaurants. The bread is baked and served in terracotta flower pots, cocktails are garnished with fresh herbs, and the creative vegetable dishes are enough to convert any serious carnivore. 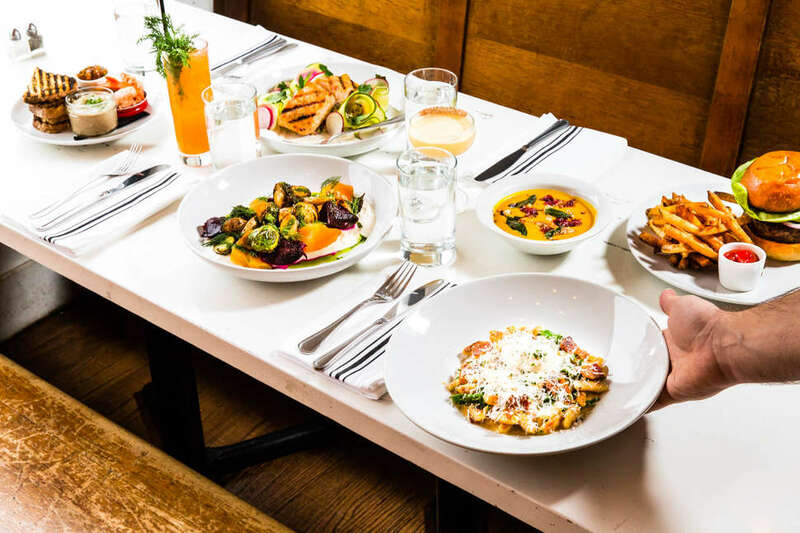 Try the honey-glazed butternut squash served with burrata and balsamic, or the spiralized zucchini drenched in house-made pesto and pistachio-crusted goat cheese -- or stick with the perfectly cooked skirt steak, topped with a pat of blue cheese butter. 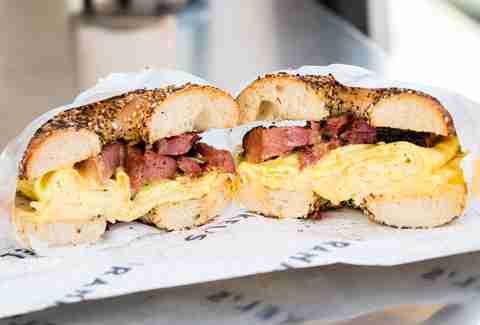 It’s easy to write off Frankel’s as Brooklyn’s trend-chasing ode to Zabar’s or Russ & Daughters -- but their classic Jewish fare is, without a doubt, the real deal. The door to the whitewashed corner building opens into a shelf lined with salt water taffy, grape juice, and boxed matzo; a display case beneath the register is packed with rows of sliced smoked salmon; and seating is limited to the counter, save for two small sit-down tables. The highlight on the menu is the famous pastrami, cured just a few blocks away, where the Frankel brothers personally ensure it stays true to their family recipe. Try it on classic rye, or on thick slices of Amy’s challah bread, and be sure to add the buttery potato latkes and a dish of cucumber salad. In the age of Instagram, the “hidden gem” is a dying breed. Le Fanfare, however, is one of those rare places. Booths with wooden benches and low-hanging lamps sit amid the raised two-tops pressed against the walls and long heavy wooden tables running through the center of the room. The food falls somewhere between French and Italian, the crowd skews neither old nor young, and the place is nestled among Polish butcher shops and bakeries. Order the house-made pappardelle served with roasted duck, mushrooms, and Grana Padano, or simply fill up on sides: braised asparagus plated with perfect six-minute eggs, beet & frisee salad with a smoked ricotta, or meatballs doused in a creamy white wine glaze. Just don’t tell your friends. Once the secret’s out, you’ll never get a table. From the team behind Williamsburg’s iconic martini-oyster den Maison Premiere, this bistro is the perfect marriage of Paris and Brooklyn. 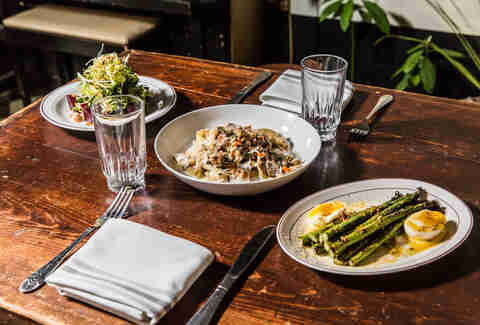 With McCarren Park-facing sidewalk seating, brown wicker chairs, and 60s work-ware clad waiters, Sauvage offers the quintessential aspects of fine French dining, wine list included. The dinner menu boasts dishes like skate cooked in a chanterelle-buttermilk sauce and buttery duck terrine with foie gras -- but the weekend brunch menu is the main draw. Pick from decadent sweets like almond French toast with coconut and mascarpone, or savory options like the egg white frittata with tomato confit and raclette. While not as excellent as the wine, the coffee is awfully good. Every morning at 4:30am, Peter Pan Bakery opens its doors to a local community of truck drivers and late-night revelers, with rows of piping hot, fresh donuts already lining the display cases. The 60-some-year-old place is pointedly free of frills, with terrible dollar coffee and cheap Formica tabletops. 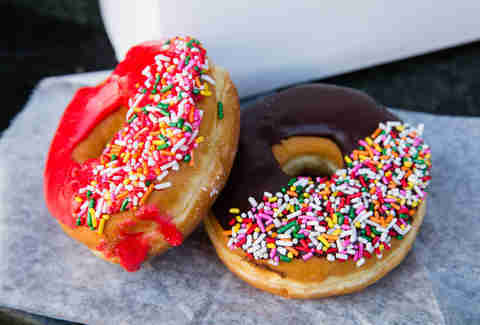 And yet: those donuts. They’re $1.10 each, served in wax paper bags, and available in all of the best traditional flavors (don’t expect some matcha-pumpkin-spice-vegan-coconut creation). Take care to arrive before 2pm, ’cause by 3, the place will be fresh out of pastries. Sit down for a casual dinner here and you may not stand up for three hours. If you don’t have a reason to leave, you won’t want to. Start with a bottle-aged craft cocktail (think hop-infused gin with Campari and Carpano) and any number of small plates like the pork rillette, beets and Brussels sprouts, or kabocha squash soup. Everything is wildly tasty, and affordable enough that you’ll feel comfortable ordering more than is necessary. The entree list includes light bites like grilled Scottish salmon with whipped feta, ricotta cavatelli with bacon, sage, and a poached egg, or a classic, hearty burger with pickled green tomatoes. Fill up, then rest. 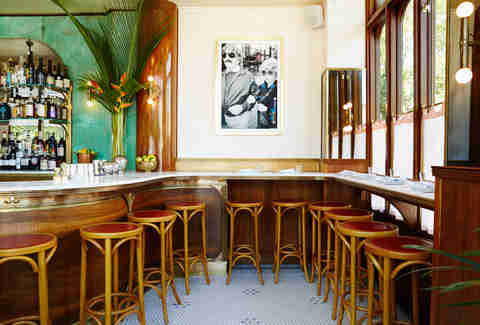 The tranquil, intimate space, full of white marble and repurposed wood, will certainly hug you to stay for dessert. The wait staff wouldn’t dare usher you out. Eliza Dumais spends an unhealthy amount of time at Enid’s. Follow her for proof @elizadumais.